Also available for download: Microsoft Word format (click here - 1MB) or Acrobat pdf file (click here 278 Kb). 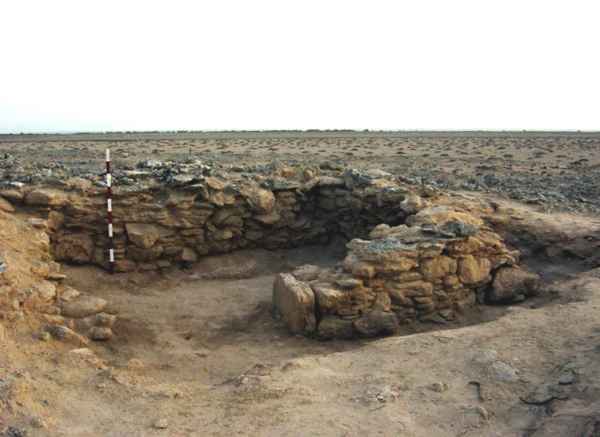 A group of stone houses nearly 7,000 years old have been found on Abu Dhabi's Western island of Marawah. They are the oldest buildings of their type ever discovered in the United Arab Emirates. The discovery was made by an ADIAS team working in association with the Environmental Research and Wildlife Development Agency, ERWDA, who are responsible for management of the island's wildlife and environment as part of the Marawah Marine Protected Area, MMPA. During work at a site known as MR-11 in spring 2003, ADIAS examined a group of stone mounds, and uncovered three buildings. One of these structures was fully excavated and revealed a well-constructed house with stone walls still surviving to a height of almost a metre in some places. During the excavations, a fine flint spear and flint arrowhead were found, as well as a fragment of a stone pestle, probably used for grinding food items. Samples of ash were taken from the floors of two of the buildings, and were sent to the Scottish Universities Research and Reactor Centre at the University of Glasgow in Britain, for radiocarbon dating. The results of the dating, recently received by ADIAS, prove that the buildings were in use between 6,500 and 7,000 years ago. No stone-built houses dating to this particular period are known from elsewhere in the UAE, although similar, but less well-preserved, examples have been noted elsewhere in the Arabian peninsula at Shagra in Qatar, and at Sabiyah in Kuwait. The latest discovery confirms the importance of Marawah, north-west of Mirfa, as an important settlement site during the Late Stone Age. During earlier work on the island, ADIAS discovered traces of a number of intriguing stone structures at another site, MR1, to the west of site MR11. 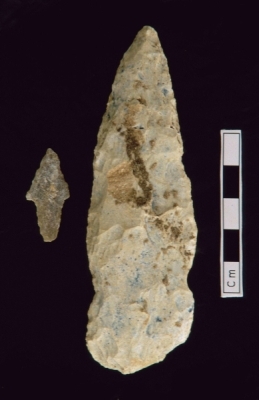 Large numbers of flint arrowheads were also collected from the surface of MR1, which was probably an important hunting settlement, and is a few hundred years earlier than the MR11 site. The importance of Abu Dhabi's islands during the Late Stone Age is also underlined by the results of ADIAS excavations on the island of Dalma in 1993-4 and 1998. These uncovered traces of circular buildings constructed with supporting timber posts. Analysis of the pottery and radiocarbon dates from these, and other, sites has shown that around 7000 years ago, there was extensive settlement on the offshore islands. The people of the time were also trading by sea with Mesopotamia (modern-day Iraq), the beginning of the UAE's well-established tradition of maritime trade. Research by Dr Mark Beech, our ADIAS Senior Resident Archaeologist, has shown that these early inhabitants of the UAE had domestic animals like sheep and goats, but also supplemented their diet by hunting gazelles, and also exploited the rich marine resources available offshore. Besides catching a wide range of fish, they also caught dolphins, dugong and turtle and ate shellfish - including the pearl oyster. The pearling trade of the Southern Gulf probably began around this time. Evidence from Dalma suggests that the people at that time also began exploiting the date palm for the very first time. Charred date stones found at the Dalma excavation represent the earliest evidence for the consumption of dates in the Arabian peninsula. The ADIAS team are delighted by these latest results from Marawah. The island has one of the most diverse groups of archaeological sites anywhere in the country, ranging from the Late Stone Age to the Late Islamic period, covering the country's history from the very earliest settlement. It is, therefore, particularly appropriate that Marawah is now fully-protected as part of the ERWDA-managed Marawah Marine Protected Area. A new season of archaeological fieldwork is due to commence on Marawah next March and April. Directed by Dr. Beech, the work will include more excavations at MR11 and also further survey on the neighbouring island of Liffiyah. The work is being carried out in partnership with ERWDA and all information collected will be added to the Abu Dhabi Environmental Database being developed by ERWDA. An ADIAS team comprised of Dr Mark Beech (Senior Resident Archaeologist) and Dr Heiko Kallweit (ADIAS Associate and University of Freiburg, Germany) will be commencing work in late January 2004 near Umm az-Zumul in collaboration with Dr Walid Yasin Al-Tikriti (Department of Antiquities and Tourism, Al Ain). A series of Neolithic (Late Stone Age) scatters of lithics (stone tools) will be mapped and further survey work carried out. The site were first identified by a team from the Terrestrial Environment Research Centre (TERC) of the Environmental Research and Wildlife Development Agency (ERWDA). Chris Drew and Ingrid Barcelo from TERC first noted the interesting scatters of flint material in this area and reported it to ADIAS. An initial reconnaissance of the area was then made by Dr Mark Beech (ADIAS Senior Resident Archaeologist) together with Dr John Stewart (ADIAS associate and Department of Anthropology, UCL, London), and Chris Drew (TERC/ERWDA). Following discussions with the Department of Antiquities and Tourism in the Diwan of the Abu Dhabi's Ruler's Representative in the Eastern Region, it was decided to carry out a joint programme of work in the area, which is part of the Eastern Region. Two weeks fieldwork are planned for late January/early February 2004. It is planned that the preliminary results of this work will be submitted as a paper to the annual Seminar for Arabian Studies conference, due to be held at the British Museum in London from 22-24 July 2004. Work is progressing nicely on the ADIAS plans for the exhibition of a selected group of Late Miocene fossils. We hope to complete the exhibit by late April/early May 2004. The fossils will go on display in the lobby of the current headquarters of the Environmental Research and Wildlife Development Agency, ERWDA, where ADIAS has its main offices. Conservation work on the fossils to be put on display was completed in October 2003 (see ADIAS November 2003 Newsletter). 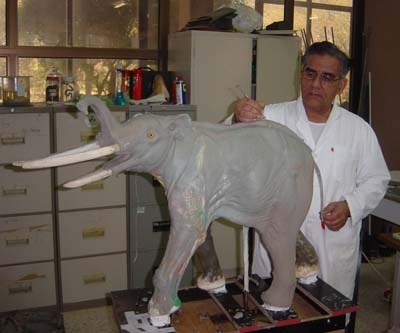 Abdul Hafeez, from the taxidermy section of the President's Private Department, is making excellent progress with our scale model of a Stegotetrabelodon syrticus (see picture). We shortly expect to receive the final outwork for our Miocene diorama, life in Abu Dhabi 6-8 million years ago. This is being prepared by Gemma Larkin, the wife of Nigel Larkin, our expert fossil conservator. Support for the costs of staging the exhibition have been kindly provided by TAKREER, who have also funded the ADIAS work at the major fossil site near Ruwais, ADCO, who supported fossil work in the early 1990s by a joint team from London's Natural History Museum and Yale University, and BP, who also supported the earlier work, and have provided logistics support for ADIAS. The latest book to deal with ADIAS work was launched on 16th December 2003. Entitled Sulphur, Camels and Gunpowder - The Sulphur Mines at Jebel Dhanna, Abu Dhabi, United Arab Emirates - An archaeological site of the late Islamic period, it is edited by Geoffrey King, with contributions by six other members of the ADIAS team. The book has been sponsored by the Abu Dhabi Company for Onshore Oil Operations, ADCO, who also sponsored our four seasons of fieldwork at Jebel Dhanna between 1998-2002. Zodiac Publishing, P.O.Box 502127, Dubai. The book was officially launched at a reception to commemorate the 40th Anniversary of ADCO's 1st Shipment, held at the Company's Jebel Dhanna terminal. A copy of the book was presented to HE Yousef Omeir Bin Yousef, Secretary-General of the Supreme Petroleum Council and Chief Executive Officer of ADNOC by Peter Hellyer, Dr Mark Beech and Simon Aspinall. 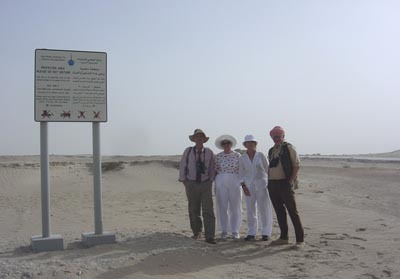 As part of the events related to the celebration of the 40th anniversary of the first oil shipment from Abu Dhabi's onshore fields, ADIAS staff took two of the wives of former ADCO General Managers on field trips to visit Miocene fossil sites at Rumaitha and Ruwais on 14th and 17th December 2003. Caroline Adams and Margot Dunne (the wives of Terry Adams and Kevin Dunne) were first accompanied by Peter Hellyer, Dr Mark Beech and Simon Aspinall on a trip to the ADIAS laboratories and storage facility at Maqta. Here they saw some of the recent fossil material collected by ADIAS from Ruwais, as well as some of the material collected earlier by the Natural History Museum / Yale University expeditions. This was followed by a field visit to a site known as Rumaitha site RM-7, around 40 km. south-west of Abu Dhabi. This is the easternmost exposure of the Late Miocene fossil deposits so far known along the Abu Dhabi coast. Valuable new fossil specimens were collected from the site including crocodile teeth and catfish skull fragments. Following the launch of the Jebel Dhanna sulphur mines book (see above) at the Jebel Dhanna terminal, another field visit was made with Caroline Adams on 17th December 2003 to the Ruwais fossil site. A nice specimen of a crocodile osteoderm was collected, as well as numerous small fossil fragments. Appropriately, Caroline Adams, and her husband, Dr. Terry Adams had been actively involved in the survey work on Late Miocene fossils undertaken by the Natural History Museum and Yale University in the early 1990s - work which was sponsored by ADCO, on the initiative of Terry Adams. ADIAS was also delighted to be able to take Margot Dunne out to the Rumaitha site - this was first identified during an archaeological baseline study of the ADCO oilfields commissioned from ADIAS by her husband, Kevin Dunne. A small group of former ADCO GMs and their wives accompanied ADIAS staff on a visit to the Late Islamic period sulphur mines at Jebel Dhanna on 16th December. This provided an opportunity to see at first hand the remarkable mineshafts and their setting within the ADCO terminal area. A copy of the new book on the mines was also presented to Mubarak bin Rashid bin Mubarak Al Mansouri, Public Relations and Transport Co-ordinator for ADCO's Jebel Dhanna Terminal. 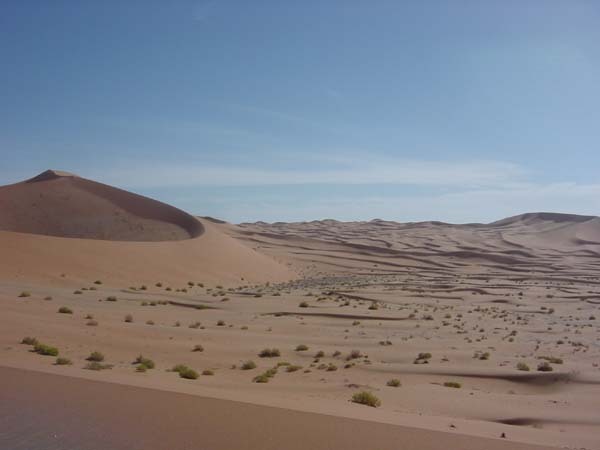 Mubarak provided logistical assistance during the ADIAS fieldwork at the site, and also introduced us to the remarkable elephant footprints in the desert at Mleisa. Dr Mark Beech and Simon Aspinall recently carried out a rapid archaeological survey of the island of Bazm al-Gharbi. This small island is located about 250km west of Abu Dhabi, at the western end of the chain of islands running from Abu al-Abyadh to Junana, Marawah and Liffiyah, forming the outer side of the Khor al-Bazm. The island had not previously been visited by ADIAS, and the survey work, carried out on 21st-22nd December, fills in an important gap in our expanding data on archaeological sites on Abu Dhabi's islands. A total of 55 archaeological sites were mapped on the island using GPS equipment. These sites varied from fire-pits and hearths to cairns and house structures. A small stone slab outline mosque was identified on the south-eastern coast of the island. A mysterious large building oriented north-south was also discovered towards the southern end of the island. The dimensions of this building were 22 x 17 metres. A large concentration of pottery was collected from an area immediately adjacent to this building. This pottery will shortly be examined to determine information on the dating of this enigmatic building.Whilst much of the pottery collected on Bazm al-Gharbi appears to belong to the so-called Late Islamic period, a number of sherds are not immediately recognisable. There remains the possibility that some of the sites identified from these surface pick-ups may be much older. 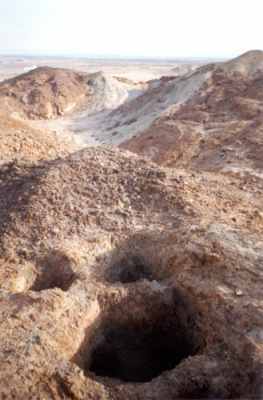 Further work will be required on the analysis of the Bazm al-Gharbi pottery, and a further visit to the island will be undertaken in order to take ash/charcoal samples from some of the hearths for radiocarbon dating. This work was carried out with assistance and support from the staff of the Marine Environmental Research Centre at the Environmental Research and Wildlife Development Agency, ERWDA. In particular, Nasser Al-Shaiba and Falah Al-Ahbabi piloted the speedboats which took us over to the island for the survey. Whilst on the island, temporary loan of a quad bike was provided by a falcon trapper working on Bazm al-Gharbi for HH Sheikh Khalifa bin Zayed. As noted earlier, our planned exhibition of Late Miocene fossils has received support from TAKREER, ADCO and BP, while the National Drilling Company, NDC, has kindly agreed to provide us with support for a two year period, in return for which ADIAS will carry out surveys of NDC onshore drilling sites before work commences. We are grateful to all of them for their support. Our expanding activities, both in the field and in terms of our databasing, analysis and publications programmes, are reflected in rising costs, and we would be unable to carry out as much work as we do without support of this kind.